Transformers: Timelines story "Shattered Glass"
"This is quantum hexi-crypto. Totally unbreakable. I'll need three cycles." Heatwave is a fictional character from the Transformers series. He was introduced in as a background character in a Fun Publications comics book in 2008, but wasn't released as a toy until 2009. Heatwave is a heroic Decepticon loyal to Megatron. He has the unusual ability to speak to non-sentient machines by touch. Heatwave speaks to machines as if they were living beings. He combines with the other 4 Transformers Collectors Club membership combiner exclusives to form Nexus Prime. Heatwave appears as a member of Megatron's heroic Decepticon forces in the Transformers: Timelines story "Shattered Glass" story by Fun Publications. Heatwave appears in Do Over. He volunteers to be a member of the crew of the Decepticon starship Nemesis and Cliffjumper allows him to join. He is on board the Nemesis when it launchs to follow the Autobot's Ark and is among the crew when they eject in escape pods to the planet Earth. In Eye in the Sky by Heatwave joins up with Ravage. He meets the human scientist Professor Arkeville and his assistants Frederick Ottman, William Hayes, and Josephine Beller. Cliffjumper, Crasher, Frenzy, Heatwave, Ravage and Soundwave are sent on a mission to Burpleson Air Force Base to stop the Autobots from controlling the GODS defense system. Heatwave uses his powers to convince the GODS transmitter to fire the weapon on itself and stop the Autobots from taking control. In Blitzwing Bop Heatwave and Blitzwing discover the Autobots are building a Stellar Spanner to return to Cybertron. Heatwave is captured and used as a test subject by the Autobots, ending up back on Cybertron, where he is discovered by fellow Decepticons Whisper. In Reunification Heatwave is introduced to Landquake and his companions, who request to meet him. Just as he meets them Cyclonus attempts to kill Megatron at the command of Alpha Trion. 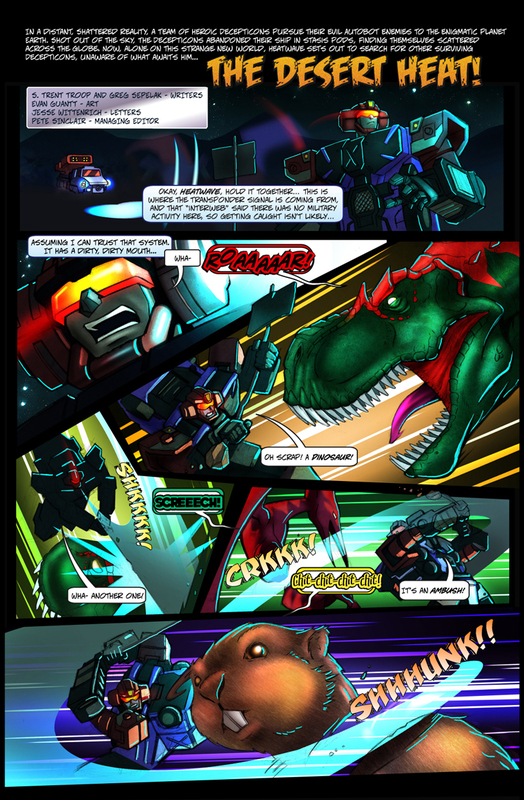 Heatwave and the three visitors attempt to revive Megatron using their combined powers. The Transformers Collectors Club 2009 member exclusive figure was Heatwave. Heatwave is a redeco of Energon Barricade with a new head mold for the combined mode. The mold was also used to make Universe/Revenge of the Fallen Onslaught. This toy measures 13 centimeters long in vehicle mode, while a real Astros II MLRS measures 700 centimeters, making this a 1:54 scale toy. With the robot toy standing 14 centimeters tall, the real world robot would stand about 756 centimeters (24.8 feet) tall. A new version of Heatwave was introduced as one of the title characters in Transformers: Rescue Bots, in which he is the leader of Rescue Team Sigma-17 and adopts the alternate mode of a Fire truck after arriving on Earth. As the series progressed he gained the ability to transform into a boat and later a Brachiosaurus. This page was last modified on 15 May 2018, at 12:27.